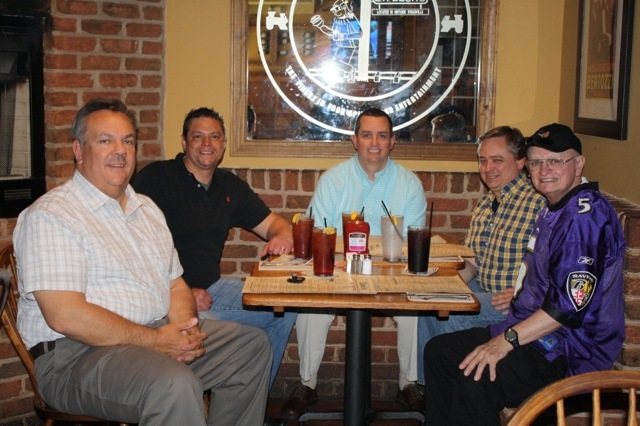 Yesterday, Harry and his three sons Patrick, Brian, and Chris were able to spend a GREAT day together. 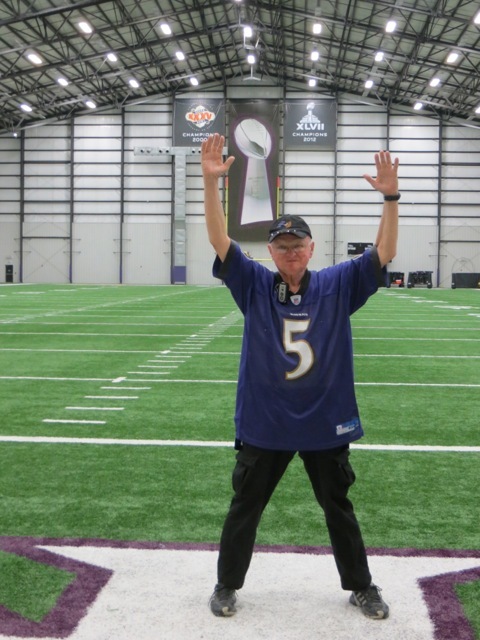 A limousine took them for lunch at EW Becks and then they were treated to a private tour of the Under Armour Performance Center and even met Head Coach John Harbaugh. 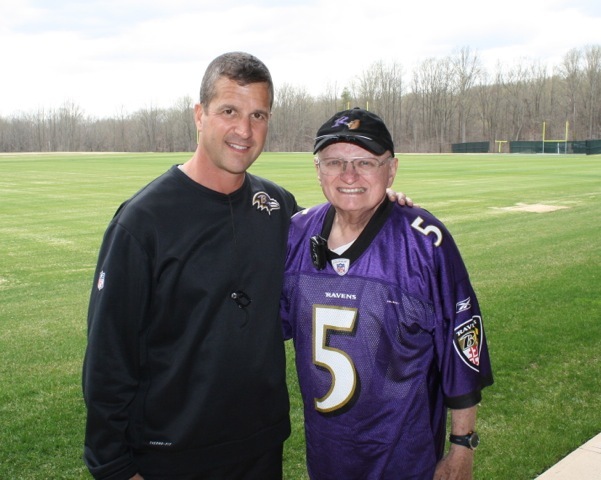 Harry shared last night a statement that blew us away, “When Patrick Gleason, our tour guide, jogged out onto the field to tell Coach Harbaugh about me being honored by The Nathan Chris Baker Foundation… that was the best… then coach asked me about my disease… and I told him… Coach looked me right in the eyes and told me – You are going to beat this… if I was not pumped already that put me over the top”. A few months ago we had a conversation with a friend and there was something in that conversation that told me they know a glimpse of our reality. They are a beautiful family full of love for their children. For years I have watched their family from the outside, wondering how they get through each day, wondering what their life is like and knowing that I would never be able to understand what a day is for them. I’ve admired the strength it takes them each day to face every new challenge. As we chatted about their son Nate, who is autistic, he shared how lucky we were to have such a huge network of family, friends, and support. We do, we are truly blessed, with really amazing people in our lives but even with all those amazing people there are still times that can be so lonely, abandoned, misunderstood, and that we still feel like the world has moved on. As I expressed that to him, there was a moment where we both understood each others perspective. And he nodded as he said, “I get it. I’m there with you.” Because even though our journey’s are so different… they are also very much the same in that we each understand we have different perspectives than the world. We are in this club that we didn’t ask to be a part of. When life doesn’t turn out the way we imagined we look at life from a different perspective. Perspective. You’ve been on my mind for months. You always bring me back to a place of internal struggle. You balance me when I’m feeling frustrated that others lives go on that the world doesn’t understand. I’ve searched for a good definition of perspective and I just can’t seem to find one that fits. Months ago, I started writing on perspective but I found that I writing was out of anger. I was angry and the words that met paper weren’t words to be proud of. I was frustrated. Frustrated that the world can’t begin to understand my perspective. Because the things that affect me are different than what may affect you. Angry that the world will never really understand what a grieving parent feels because unless you’ve walked in these shoes it is impossible to understand. Frustration that because I’ve been through the unimaginable that my perspective is different than yours and no one will ever quite understand my perspective. Because sometimes no matter how amazing my support network is, grief is a very lonely feeling that nobody can understand what we go through. Because some of my lowest lows are when people just don’t understand us. Because I’ve built a wall to things that may seem small to me but are still big to you. Because things that are small to you can be huge to me. Because things that people say can literally break my heart but to them it’s an ordinary conversation that I can’t expect them to understand how their words can affect me. Because I feel guilty about that and I am learning how to cope and interpret my perspective and still finding my path to understanding other perspectives too. Because I want to be the person I was before that is understanding and compassionate to every situation and not fall into a pit of my own self pity. I miss Nate every day. I think of him in everything I do. He pops into my mind in the smallest ways. I wonder how our life would be with him here? I watch Drew mature and Kaylee grow and wonder where Nate would be. We sing in the car, play outside, eat dinner, register for sports, or watch a movie together and he’s on my mind. I miss his mischievous smiling face. I’ve said it before, I just want to run my fingers through his thick hair or feel the “spikes” as he would call it after he got his hair “cut like Dad’s”. It’s the little things that I miss most. 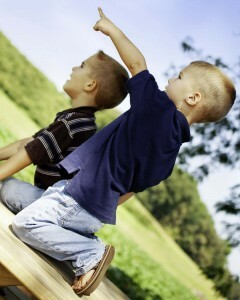 From childhood we dream about what our life will be. We never dream that it will involve the loss of our child. We never dream of a life of heartbreak. From the moment I found out I was pregnant with Nathan, I dreamed of what his life would be. I dreamed of him walking and talking, riding bikes, going to school, hanging out with friends, having his brother as his best friend. I even imagined the trouble he would find and the parenting challenges we would face. I imagined Nate as a father himself. I still sometimes find myself dreaming of Nate’s future when I dream of Drew and Kaylee’s and in an instant am hit with a hard reality check of my life. How does someone let go of their dreams for themselves and let go of the dreams they had for their child? 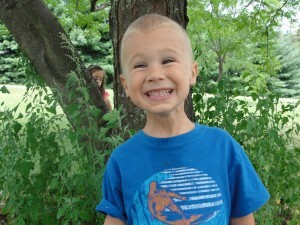 How do parents move forward with a piece of their hearts missing? The truth is that we can’t expect answers and we can’t expect anyone to understand. I often find myself in a pit of internal struggle of realizing that no one will ever fully understand what it is like to walk in our shoes and the battle to accept that reality as well. So the challenge continues to be understanding that perspective. Some days I am quiet and I am taking in the world. I tune in deeper to the emotions of our souls. I love deeper. I laugh deeper. Every day Justin and I try to soak in every minute with Drew and Kaylee, to encourage them and love them and give them the happiest life we can possibly give. I don’t want to miss a second. I want to take in every moment because we really don’t know what tomorrow holds. I find I laugh at the little things much more than I used too. I let more blow over. I certainly have days that they test my patience, they break the rules, and leave me asking “Is it bedtime yet?” But even on those days I look back on the day and feel so grateful for another day I cherish immensely. Some days I can honestly say “I’m not okay but I’ll be okay.” Some days I just don’t want to be strong. Some days I’m overwhelmed by love and even laughter. Drew and Kaylee bring the biggest smiles to our faces so many times each day. They can leave me feeling full and complete. They can leave me rolling in laughter. The joy that they bring me also leaves me with sadness wishing I had Nate here to bring me those things too. The good days, I often find guilt in enjoying the day. It’s emotional to have joyous days with my family and still miss Nate beyond measure. He is on my mind all the time. Some days I have to stop and look around at my life. It’s not at all what I planned it to be. How is that explained for one to understand what it’s like to wake up one day, without your son, and be the same person you were the day before? It’s been a year and a half since losing Nate and I am still changing every day. I choose to be better and I choose to wake up each day and make what matters most to me count even when it hurts beyond words. I am choosing to learn compassion for the world’s perspective and trying to find the balance in understanding that the world will never understand what a day in my shoes is like or understand our souls. The key is to allow myself to accept the differences in each of our lives and be okay with that. I’m learning to not let my perspective leave me frustrated with the world but to let it lead me to beauty. My heart aches for Heaven and it aches for Nate but my heart also loves to be filled with joy by this world. There is not a Band-Aid that can heal my heart but there is a God that has given me hope and the daily desire to seek joy. We are over the top excited to announce a project that has been in our hearts and in the works for a few months now! It’s really more than a project… it’s about giving back to the community and providing a Great Day! Last year, at the Stacy Hart Photography Fundraiser, we partnered with Stacy and gave away a photo session to one deserving family. Since then, my heart has fluttered to see the impact of a family photo, the joy in their faces, the gratitude they displayed, and the willingness to pay it forward. So, in January, as Colleen Gallagher (one of our fundraising coordinators) and I ran a few errands together she had a brilliant idea. “I’ve got this limo gift certificate that I bought at a silent auction and I haven’t been able to use it. I think we should give it away to a deserving family. Maybe a limo ride, dinner out, and a movie. A night out that maybe the family can’t afford, is battling sickness and could use an evening to relax, or just a deserving family.” If you know Colleen or I, then you know our mouths spilled ideas faster than our minds could process. And we were off. To hear a family say, “Today will be a GREAT day!” No matter how big or small – we can make a difference in someone’s life. It doesn’t matter how big or small the planned Day Of Greatness may be, it will still be a break from reality for a family in need. Part of our mission at The Nathan Chris Baker Foundation is to provide financial, physical, and emotional support to individuals, families, and communities in need. We would love the chance to pass greatness forward. Nate would be so proud of this. He would love it. He would be right in the middle of the planning and ask a zillion and one questions. He’d be presenting ideas about what we could do for these families and his main goal would probably be being involved and making more friends. He thrived in busy-ness and social settings. He loved helping people. I would bake cookies, brownies, muffins, cakes many afternoons with him helping me. He would love to put plates of goodies together to take to his friends. I’m not sure which he loved more, baking with me or sharing our work with friends. I am positive he would feel the same way about this. 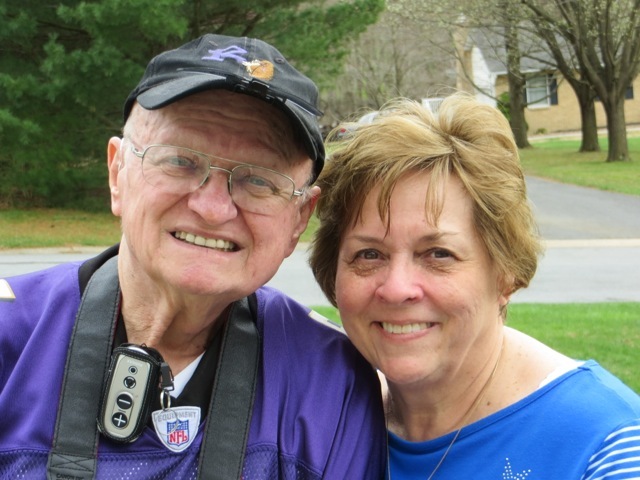 He would love finding families, planning a time out for them, and sharing greatness along the way. We really want this to be successful and have an impact on the lives of others. In order for this to work…….we need your help! To nominate a deserving family please send us an email at GoOutBeGreat@nathanchrisbaker.com and tell us about the family you would like to nominate, why they are deserving, and ideas of interests for their possible day of greatness. Through the information that you provide we may be able to give a family a Day of Greatness. Together, we can make the lives of others special, one day at a time. 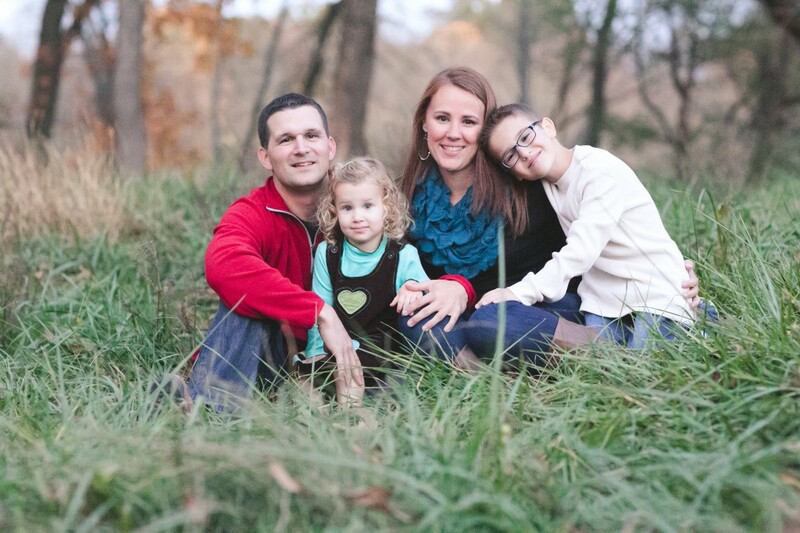 Keep checking back to learn more about the families we give Days of Greatness to! We hope to blog about this journey with guest posts from our team! At Nate’s service, the talented Melody Workman sang through emotion filled eyes, Natalie Grant’s, “Held” for us. The song was and still is heart wrenching, breath taking, and overwhelmingly beautiful. I don’t remember much of the service to be honest with you. But I know when “Held” was sung, it held my heart through the tears that fell. Following Nate’s service, I listened to that song many days on repeat. Some days it brought me peace. Some days it drove me, I’d belt it out as we drove and listened to Drew just belt it out in the back seat as well. Some days it brought tears that streamed off my face like a waterfall. If I’m being totally honest there came a point in time where the music from Nate’s service and from the days after his service that actually became painful to listen to. I have a track of songs that a good friend put together for us from the service and songs meant to carry us. And they did carry me for a period of time. Until I found that when I turned them on, they suddenly became sad and washed me with deep pain and grief. It felt as if my body would warp right back into the days and weeks and months following Nate’s death and would paralyze me with pain. Heart. Breaking. Pain. I couldn’t bear them. So I stopped listening. And honestly, when it hit my shuffle playlist, there were songs I had to skip because I knew if I listened I would flash back into a time of deep, deep pain. I read those words and my heart raced. It was as if I had put them into that blog. As if this mother had really experienced the exact same things I had. I even blogged months ago about being "Bitter or Better". I remember very clearly on September 3rd, 2012 making that decision in my mind of how I would carry through this. My loss hurts, it’s pain that can’t be expressed in words, but is wrapped in peace that leads to hope, and that can’t be explained. This is what it means to be held. How it feels when the sacred is torn from your life. And you survive. This is what it is to be loved. And to know that the promise was. When everything fell we’d be held. I remember sitting with a heavy feeling as rescue crews searched for Nate . Still. Paralyzed. Lifeless myself. Unable to move. It felt as if there were weights on me so heavy they weighed me down so I could not move. I just watched knowing what was happening but not able to move to do anything. I didn’t talk. I didn’t scream. I just sat. I remember knowing that I wanted to do something and not being able to peel myself out of the chair. It was as if arms had wrapped around me and just held me and wouldn’t let me go. That feeling is one that when I am deep in sorrow I can still feel. It took me months to understand that feeling. One night, during a bible study, it came to me. It was God. He’s had his arms around me tightly. He was holding me the whole time. He literally wrapped his arms around me to hold me, to keep me from screaming in pain, to love me, and carry me through the days to come. When feeling worn down… I write. And this is what comes out… But JOY does come in the morning. I am so tired of being tired. I want my old self back. I want my old life back. I want Nate back. Will grief always be such an exhausting weight to carry around? Some days when the exhaustion sets in on top of exhaustion and I feel like I’m using every ounce of what I have left I get this urge to just throw my hands up and say I’m done. I’m tired of fighting. I wish grief were a weight I could just put down for a day. It’s a heavy burden to carry each day and one that can only wear you down with time. I wish grief could be boxed up and only opened when I have the energy to carry it. The road of grief is long. It is a road that I never imagined I’d journey through. But here I am, journeying through, stumbling along the way, but still moving. The pain is in everything we do. A mothers heart never stops. A father son outing. Kaylee asking over dinner “Where did Nate go” with a curious look in her eyes as she tries to make sense of it all. An empty bed, a sippy cup, a matchbox car turning up in a corner, a picture, a story, a coloring page with his artwork, a wrestling tournament, an empty seat in a car, and memories everywhere. I’ve heard that when we are feeling so worn down we are the most vulnerable. Maybe that’s why when I feel worn, is when I share the most. It’s when I remove the mask and let it out. It’s also when I ultimately look to God and say, okay I’m done. I need you. Don’t let me lose hope. I want to trust you to lead me through this journey and bring me to solid ground. I love that I can wake up the next day feeling refreshed, re-energized, and full of strength and love to tackle another day. There’s an inspiration deep inside of me to be great each day. That feeling doesn’t come from myself alone. A year and a half ago I would not have predicted this is where my life would be. I had a perfect family of 5. I was ready to tackle that craziness every day and love every second of it. After losing Nate, I was scared. I was scared of what my road ahead looked like. I am blessed by family, friends, and faith. I listened to them and to God and followed a path of Hope. I am still learning and being refined daily. I am still growing stronger. I still have days, and probably always will, where I’d rather crawl into pity and grief than tackle the day. But most days, I can hold my head high and be proud of where we are and what we are doing. Greatness lies in each one of us. Experience it. Believe it. Pay it Forward. Show it to others. The summer of 2012, I scheduled our photographer Stacy Hart, to take pictures of our family of 5, for that October. I knew I wanted fall pictures for our annual Christmas card and I wanted to get on her schedule early. I’d searched Pinterest and created a board for lots of cute pictures, poses, and styles to gain ideas for the perfect picture. To be honest, I’d been planning that photo session for years even before having Kaylee. It was the family photo session I had waited years for. A session for a family of 5 that never happened. And a Christmas card that was never sent. 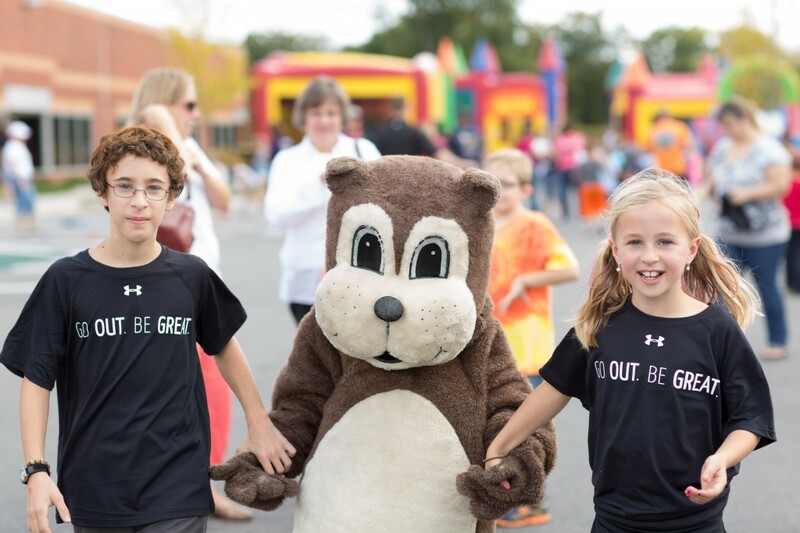 In October 2012, Stacy still came to town as planned, as she had generously offered to host a mini-session fundraiser to support our playground mission at Mechanicsville Elementary. We did have Stacy take pictures of Drew and Kaylee that day but we couldn’t bring ourselves to take a family picture at that session. A family picture without Nate, to stand together with 2 children and not 3, was just unbearable and cruel to the heart. I know the emotional value of a picture all to well. 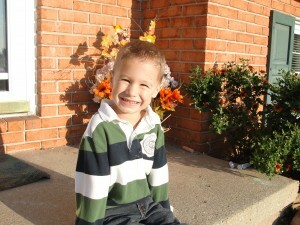 And although, most of the time, looking at pictures of Nate is still so painful, I am so thankful that I have them. I have professional pictures but I also have thousands of photos taken at home and around the house. Each picture is so special to me. So, as hard as it is to take a picture sometimes I still snap each and every one because I don’t want to forget a moment. In January 2013, we celebrated Kaylee’s 2nd birthday. We did manage an impromptu family picture after she blew out birthday candles. In July, 2013 we found courage to stand for a scenic picture while hiking in Tennessee. While vacationing in the Outer Banks in August, in the quiet with my sister in law, we again managed a quick family picture. To date, I haven’t shared family pictures. It’s hard to look at our pictures as I see, us as a family, a year later. I can’t put into words what it feels like to see a picture without Nate. There’s an empty space that should be filled. I have to admit even when I take a picture of Drew and Kaylee together my heart skips a beat and my finger struggles to snap the shot. It happens every single time. My mind knows I need the pictures. My heart wants Nate there too. When I look at picture, I can usually spot right away where Nate would be in the picture. I can picture him there with us. His arm wrapped around Kaylee, standing tall beside Drew, or hugging Justin and I around the neck, as he pops up from the background. In October, when Stacy was in town, for the 2nd Annual NCB fundraiser, she convinced us last minute to take a family picture. It was getting dark, we hadn’t matched perfect outfits, and we didn’t have the perfect pose. But what Stacy captured that Saturday evening will forever be held dear in my heart. She captured a family that sticks together and loves. A family that has dedicated themselves to let their lights shine, to love deeply, to seek joy, to keep pressing forward in life, and to live for Him. A family that continues to be refined. A family that hurts deeply but also finds hope in each day. A family that still feels blessed in many ways. A family that said we would Be Great For Nate and is living out that promise. So this year, I still can’t send a Christmas card. Some day I will but not yet. But I will share our Christmas wishes, from our family to yours, Merry Christmas and Happy New Year. Thank you all for all of your love, support, friendships, and prayers in 2013. Fall is hard. I’m coming to realize this, as I try to figure out my feeling of exhaustion and heaviness, now that the busy-ness of summer, and fundraising, is slowing down. Fall is a beautiful changing of seasons but I’m having trouble getting past what it now reminds me of. As, I drive through country roads, I see these winding streets draped with colorful leaves. But what I immediately think of is deep grief and pain. Last fall, I was driving down the same streets streaming tears. Last fall, I was grieving. This fall, a year later, I am grieving. It’s been over a year since we lost Nate and now when I speak of the grief it becomes plural in years. It becomes the reality of which fall was it that Nate was here. Winter is coming. The days are getting shorter. It’s getting colder and we are outside less. The holidays are coming. Nate’s birthday is coming. It’s happening and fall means it’s all closer than I want it to be. That hurts. This past week, I was talking to Justin about the house and how old each appliance was. We moved into this house when I was pregnant with Nate. So I’ve always been able to easily spout out how long we’ve lived here based on Nate’s age. Well, last week, when I was confused on how long we’d been here I got mad at myself. I had to stop to think about how old would Nate be this year? I’m sorry, would? Not, how old will Nate be but how old would Nate be? That hurts. Nate would be 7 in December. Then I immediately turned to grief of wondering what would Nate be like? Would he be exceling in sports and at school? Would he love school? Would he be getting in trouble at school with daily reminders or be the star behavior student? Would he have lost teeth? Would he be reading chapter books and learning math? How much would he have grown? What size clothes would he be wearing? Would he still love trucks or be growing into bigger boy things? What would he have chosen for his Halloween costume? Would he have sat with his friends on the Halloween hay ride? Would he have led the pack? Would he have taken Kaylee by the hand and led her to each door step to say trick or treat? Would he be scouting the Christmas toy magazines circling toys? Would he check the mailbox each day to see which new catalogue came? Would he be sitting on a Sunday afternoon to watch “Lorax” with Kaylee and Drew or would he be outside on the trampoline? Time. It’s an interesting thing. I don’t feel like time heals all things. It just doesn’t. But time does change it. Some of the immediate pain and grief from last fall has changed to wonder this fall. I want to just hug Nate. I want to smell him. I want to hear his laugh. I want to run my fingers through his hair then kiss him on the forehead. I don’t want to forget these things that I loved. One of my biggest fears is forgetting these things. So, last week, when it took me more than 1 second to figure out how old Nate would be… that’s scared me. Kaylee is so much like Nate in so many ways. Sometimes I wonder if it’s us just making it into more but then there are times I will hear her say something with a certain authoritative tone or give me a stink eye or crack up laughing and I will have to look twice. It’s Nate exactly. It makes me smile to see so much of him in her. It helps keep the memories fresh. My kids are my world. All 3 of them. They are my everything and I will always do everything I can to protect them, teach them, love them, encourage them, raise them, and just have fun with them. As a mom, I want the best for them. I’ve always parented pretty confidently. But the walk of parenting children who’ve lost a sibling… there’s no right way to do that. I pray daily that we are making the right decisions. I want Drew and Kaylee to grow into adults that know Nathan and remember what they can of him even if it’s through countless pictures. I want them to feel confident talking about Nate. And confident to tell us when they have worries, fears, and are sad. There are days that I want to trap them in a box and never let them go. I want to protect them from everything. But I know that also isn’t possible. I want to raise well rounded, easy going, capable children and if I trap them in a box they will be robbed of experiencing all this world has to offer them. I want to always make sure they know how important they are to us and how loved they are by us. I never want them to feel that Nate’s legacy overpowers who they are. They are equally important in our eyes. I never want them to look back at losing Nate as the day their mom changed forever or say “My mom was never the same after Nate died”. Tears well up and the lump in my throat rises as I write that but that is one of my biggest fears. As I wake up each day and make the choice for hope and happiness for myself, I also wake up making the choice for hope, life, love, and fun for my family. I don’t want to be scared of this world. I don’t want my children to be scared of this world either. I want to embrace it. I want to live it. I want to love it. I want to cherish every day here until we all meet again in eternity. We at the NCB Foundation had a blast at the 2nd Annual Nathan Chris Baker Fun Day. The weather was perfect and everyone had a great time. 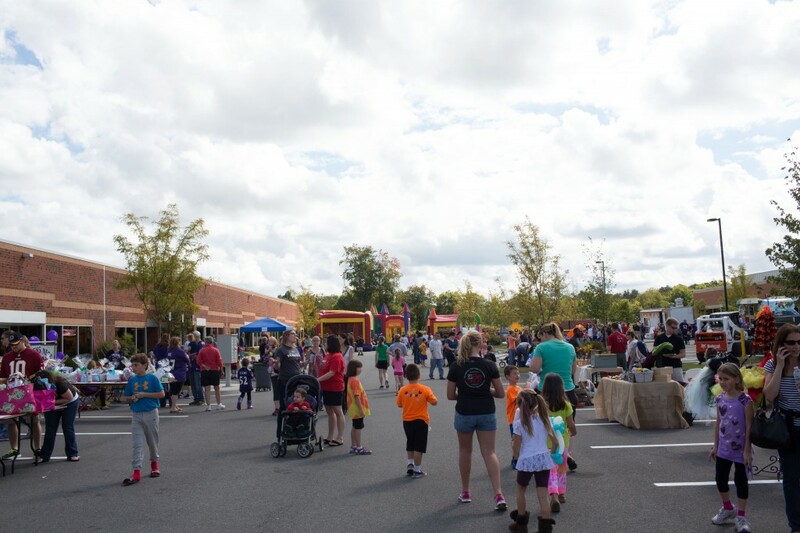 As we looked out at the parking lot filled with bounce houses, vendors, police cars, fire equipment, and kids running around laughing and smiling – we were amazed at the support of our family, friends, and community. We also realized that all of the hard work that the Fun Day committee had put in over the last 4 months was coming to fruition. In late September 2012, two kids – Justin and Ridgley approached their parents about doing something to remember Nathan and raise a bit of money to put towards “scholarships or something” as they told their parents. Justin and Ridgley are friends of our family and both knew Nathan. They are great and caring kids from great families and we are blessed to have these families in our lives. Justin’s parents own Hoppers Kid Zone (a great local bounce house place) in Eldersburg. Ridgley’s parents are heavily involved in the community and her father was Nate’s baseball coach. Justin and Ridgley’s parents took the idea of a fundraiser and approached Katie and I. Things from September 2012 remain blurry to me but I don’t think we hesitated to say yes. By November 2012 the 1st Annual NCB Fun Day was off the ground. A simple idea from 2 kids took off and brought a community together on a cold and windy day in November. It was a huge success and one of the reasons we were able to give so much to Mechanicsville for the playground fund. Immediately after our first Fun Day you could tell that everyone involved was excited and we talked about how we would make this event even better in the coming years. When we began to plan the 2nd Annual Fun Day we put together a group of local friends and families who we knew are just as committed to this foundation as we are. We also knew that this committee knew the roots of this event and recognized that this day took place because of the GREATNESS of some kids. We wanted these kids to know how great this idea was and we wanted them to embrace the idea of Go Out. Be Great. A big part of what we want to do at GOBG is to inspire others to make a difference in the lives of those around them. This is especially true for kids. We want kids to know that no matter how small the act of kindness is……the impact is priceless. The impact has the ripple effect on those around them. A kind of pay it forward mentality. We truly believe that one day everyone will need the help of another. Whether you believe it or not – you can’t plan life. Life is going to happen and some day – you will need someone else to provide you with something. A place to stay, a meal to eat, an ear to bend, a shoulder to steady you, a smile, maybe just something a simple as hope – a hope that things may be bad but they can get better. We want kids to know that they can be that force that helps to change others. When our team began planning the 2nd Annual Fun Day we wanted to make sure that the kids were the focus. We realize that this is a major fundraiser for the foundation but it is also because of Nate that this day was born. It was because of other kids who set their sites on a GREAT idea and we always want to remember that and make this day about the kids. As the team began to plan the events of the day we knew that the children of our team members would be heavily involved in our efforts. Even if it was just a late night planning meeting at Hoppers Kid Zone, the kids would more than likely be there bouncing as we strategized. We also knew that the kids would have their own stations at Fun Day. Some would sell bracelets or jewelry that they made, others helped with face-painting or tattoos, some helped us make signs, and volunteered for the dunk tank. Some of these kids knew Nate and others never met him. All of these kids poured their hearts into lending the talents that they have to give back to this event and foundation. I want to share the story of one particular kid who approached a member of our Fun Day team with an idea he had to help. Chase is a 10 year old and creates some really great paracord bracelets which are extremely popular. Chase asked if he could make some bracelets and sell them at Fun Day. He wanted to sell his bracelets and make a donation to the NCB Foundation. During the weeks prior to Fun Day we were told that Chase was hard at work making his bracelets which he called Chaselets. We were told that he was super excited to be able to be part of Fun Day and we were excited to have him. I walked around Fun Day checking on things when I located Chase’s table for his paracord bracelet – The sign read: Go Out. Be Great. – Chaselets – The sign had other information on it but I couldn’t get past the first two lines. This kids had taken an idea, invested in his idea, created his product, and was marketing it as well. I was really impressed. I had the opportunity to meet Chase, his mother, and sister that day. What great people. As I spoke with Chase I could tell that being a part of this day meant a great deal to him. I could tell how proud he was to be a part of it. I could tell how proud his mother was of her son who had put his heart into this project and giving back. Chase did very good at Fun Day and sold a lot of Chaselets. Chase donated $150.00 of what he made at Fun Day to the NCB Foundation. As we sat around totaling the events of the day we saw the $150 that this little guy donated – every member of our committee was just in awe. After meeting Chase and talking with him about Fun Day and what it meant – that $150 could have been $15 and would have still meant just as much but to a kid a $150 is a fortune. At the end of the day we were told that Chase had faced his first organizational/business dilemma. Chase had every intention of giving his handmade sign to Katie and I after the event – something we could keep as a reminder of the day. When it all ended Chase was kind of attached to that sign and he and his mom talked about whether he wanted to keep it or give it away. Luckily someone from our Fun Day committee stepped in and suggested that Chase keep his sign and that Katie and I would want him to have it. They were right and Chase kept his sign. I am glad he did. I hope that sign serves as a reminder of the great thing that he did on September 29, 2013. I hope that sign encourages him to continue to Go Out and Be Great. I am very proud of all of the kids that participated at Fun Day. If a group of kids can make a difference in the lives of others – think about what we as adults can accomplish. The power to help others is at our fingertips. It is the most rewarding thing you will ever experience. Greatness lies within each one of us – Experience it. Show it to others. Pay it forward. Go Out and Be Great. In January, I signed up to run the Diva half. I wanted to support my friends even though running wasn’t really my thing. At that point, 1 mile was a challenge and I was in physical therapy for my knees so 13 Miles seemed like a bit of a stretch! Throughout months of training, I had a lot of knee pain and at some points wanted to give up. I kept thinking about what Justin and Katie and their families have gone through and no amount of my physical pain could ever even compare. Being at the run with so many wonderful people who were (or seemed) as nervous as I was made me so proud to be on Nate’s team! 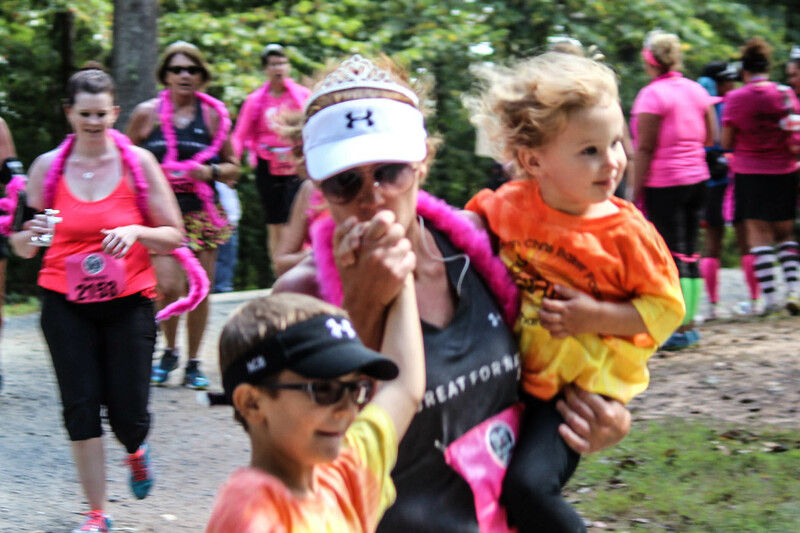 While I was running through the beautiful (and hilly) country, I found myself fighting tears as I thought about the impact that Nate and his amazing family are making. Thank you for continuing to share your hearts and allowing me to be a part of this journey. God has always been there and continues to carry us when we feel like we just can’t take one more step.